We can hardly say the four-door sedan segment is wanting for choice. Seen as the bread and butter of many a car manufacturer, a mid-size sedan’s success can make – or break – a company. Unsurprisingly, that means competition is hot. What it also means is that most are designed to attract a large audience, with carmakers taking the safe route in terms of design and performance. In fact, many representatives of the segment look strangely similar from the outside. 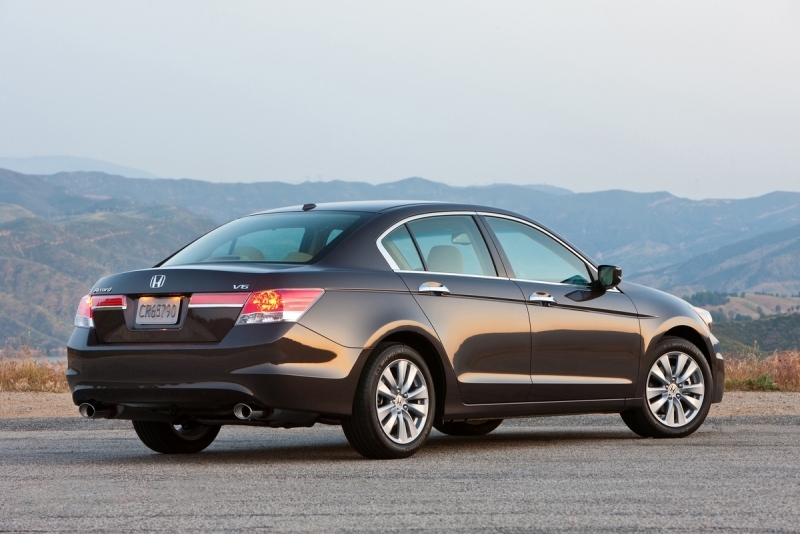 Thankfully the Hyundai Sonata’s exterior design broke through the fog in 2011, but interestingly enough, Honda’s Accord remains one of the standouts for 2012. Why? Because we actually enjoy the way it drives. Some sedans have gotten soft, which isn’t all bad – though the motion-sickness-prone kids in the back might disagree. The Accord sedan, on the other hand, is agile and grounded – not unlike many sport sedans on the market. The EX-L V-6 represents the tipity top of the Accord lineup, and with it comes an array of standard features. Despite the extra trimmings, we find ourselves pining for a simpler Accord. While the balanced drive remains, the V-6 lacks the charm that the four-cylinder has in spades, and if fuel economy and cost are important, opting for the smaller engine will reap rewards. The Accord is one of the few cars in this class and price range to deliver solid drive characteristics. The V-6 engine provides on-tap acceleration and a good amount of power. With this top-of-the-line model, everything comes standard. Passengers will experience some seriously roomy rear seats, and cargo space is plentiful as well. Driving position is ergonomic for a range of driver sizes. Instrument panel needs updating and simplifying. The navigation system is outdated. Mid-size isn’t what it used to be; this Accord is plenty long – it’s technically classed as a large sedan by the EPA – and you’ll rediscover every inch of it when trying to park. Exterior styling is a little too vanilla for our liking. We’ve mentioned that the highlight of the Accord is its on-road demeanor, and that holds true for the V-6 model as well. The sedan is predictable and sure-footed, even on twisty roads, and never feels unwieldy. The suspension doesn’t liquefy the ride too much either; there’s plenty of support around corners, but the sedan still manages to stay comfortable over bumps city streets. It’s a balance that many other sedans can’t seem to mimic. The V-6 offers considerable power, as well as quick acceleration off the line and at speed, but its added heft lessens the athleticism we found in the I-4. Still, the cabin is quiet – additional noise reduction efforts are standard on this trim – and seating is comfortable for all. 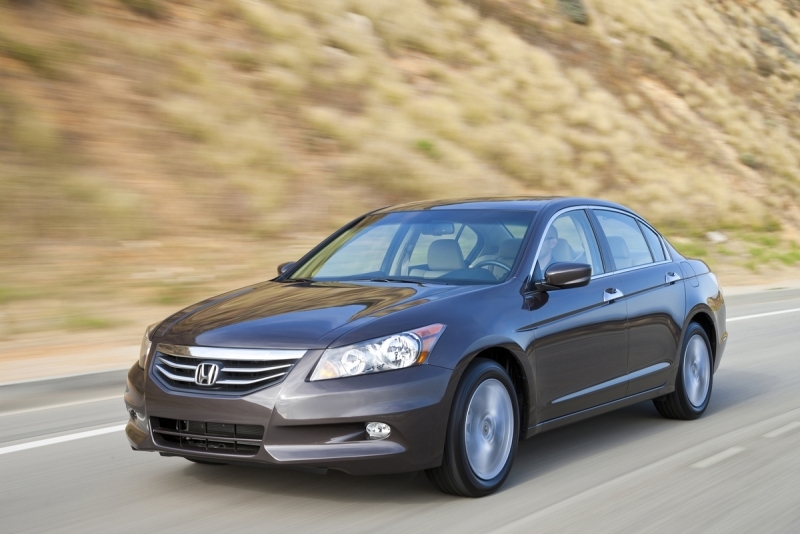 The 3.5-liter V-6 is the larger of the two engines offered under the Accord’s hood. With 271 horsepower and 254 lb-ft of torque, it has a considerable advantage over the four-cylinder’s 177 hp and 161 lb-ft of torque. It, however, doesn’t manage the power as well as the smaller engine, especially compared to some of the other sedans in the segment. Five gears may seem to be one too few (and perhaps it is), but the automatic transmission shifts quickly and gearing is spot-on. Unlike the four-cylinder version, the V-6 isn’t particularly frugal and suffers against newer entries in the segment with more powerful, yet more efficient turbocharged four-cylinder engines, like the Kia Optima Turbo. 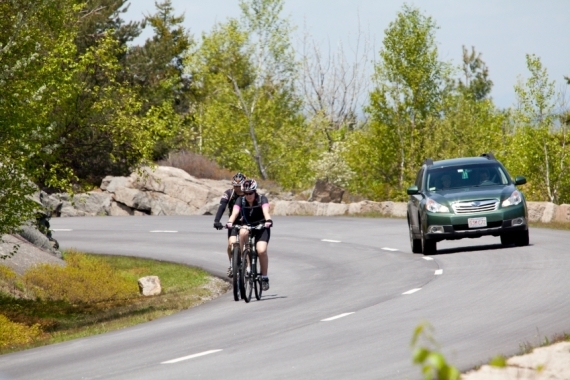 City driving will yield 20 mpg, while you’ll get 30 mpg on the highway for a combined 24 mpg. Far sportier sedans are now returning similar numbers to those. As you’d expect, this full-loaded Accord is, well, fully loaded. Convenience items like Bluetooth connectivity, cruise control, and a leather-wrapped steering wheel with mounted controls are standard. So is a 270-watt audio system, which features a six-disc CD player, USB connector with audio interface, and an auxiliary input jack for music listening through nearly every medium. It takes a little time to get a handle on the screen's interface, but it’s actually quite good – despite the system’s outdated graphics. A navigation system can be had for an additional $2,200. 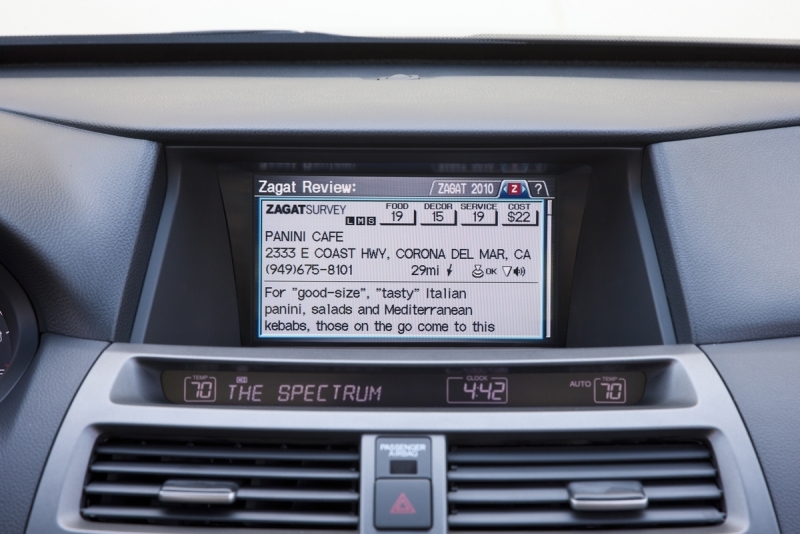 The system readily responds to voice commands and includes Zagat restaurant reviews and a rearview camera with handy parking lines to help you wrangle the sedan into too-small mall parking spots. The materials found in the Accord’s interior are still high quality, but the center stack is screaming for an update. Shiny new interiors from the competition have outstripped the Accord’s, and the many buttons are overwhelming. Seating is still incredibly comfortable though, even in the rear. Honda has added some inspiring lines to the otherwise standard shaped Accord. The front end’s long nose culminates into a blunt tip, with Honda’s familial grille being bookended by angular headlights. The large amount of sheet metal is visibly divided by one long slash down the body panels. Fitted with the V-6, the Accord’s most likely competition comes from the newly redesigned Volkswagen Passat and Toyota Camry. Others worthy of a test drive are the Kia Optima Turbo, Hyundai Sonata Turbo, and Ford Fusion V-6. 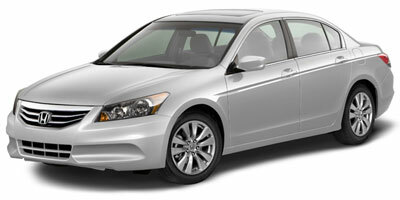 The Accord itself starts at $21,380, but reaches $29,630 with the V-6 engine. Pricing is a little high for the moderate gains in performance and features. Usually it’s the more powerful engine that outshines the lesser trims, but not so with the Accord V-6. This particular Honda lacks the competitive edge the four-cylinder has over the other four-door sedans, especially in price and fuel economy. Newer models from Kia, Toyota, and Hyundai offer up better fuel economy and more power than the Accord V-6. A redesign is in the works to bring the Accord back in line with the others though, and we can’t forget its good qualities – comfort, spaciousness, and a drive that we find impressive and enjoyable.